The AirGraver requires only 0.1 to 0.3 CFM depending on the depth of engraving or impact operation. A small air compressor is all that is necessary. When shopping for a small compressor make sure it is capable of at least 60PSI and has a tank of at least 1/3 gallon. 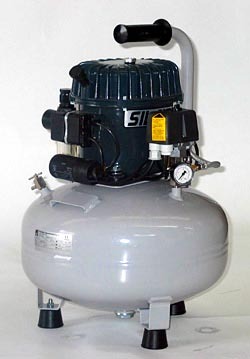 Campbell Hausfeld makes a small one gallon compressor for $59. 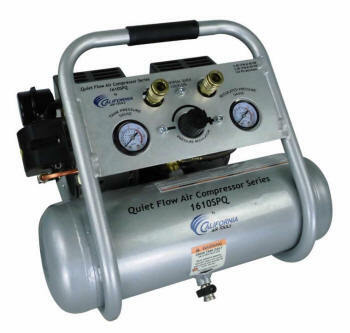 Ace Hardware and WalMart carries this compressor and several others. Check your local hardware and discount stores. 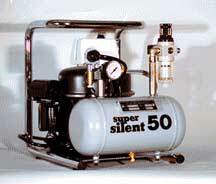 For a quiet compressor consider the Silentaire compressors. Recommended size for AirGravers and/or continuous rotary engraving. This compressor is large enough to run the NitroG20 handpiece in additional other piece of equipment .i.e. table-top jewelers sand or bead blaster. If ordering other than within the 48 states please contact use for a shipping quote.